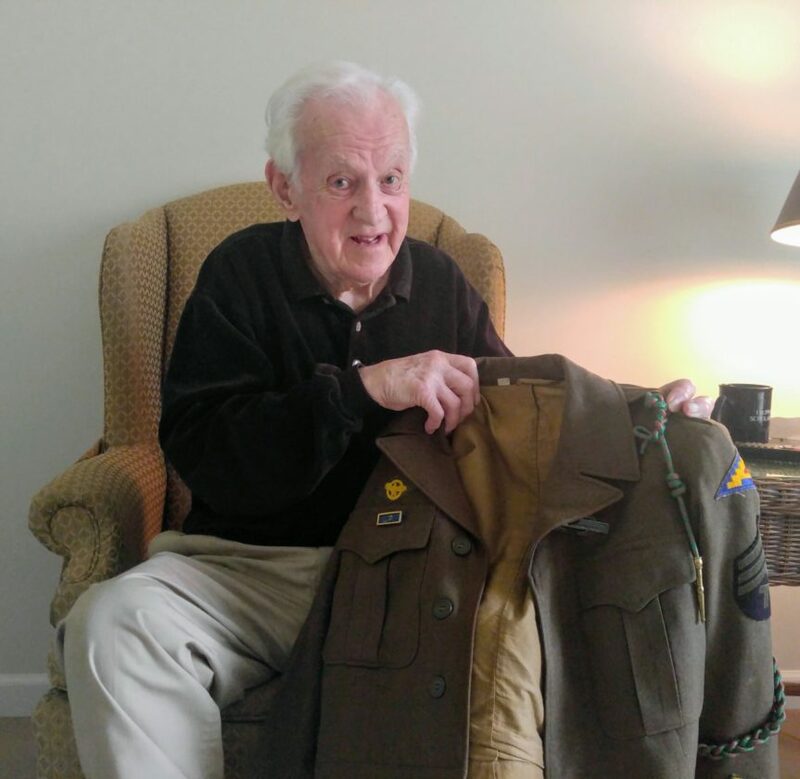 John Carter Rowland holds up one of his uniforms he wore during WWII. Editor’s note: The following is part of the Robert H. Jackson Center’s Defenders of Freedom project, which highlights stories of area WWII veterans. It was an unusually cold winter near the range of the Vosges Mountains in eastern France as the Allies worked to push the Germans backward toward the Fatherland. Some days remained well below zero and the Americans in the Third Infantry Division used an array of pillow cases and sheets to camouflage their jeeps and artillery. “Junior, stay here,” the company commander told John Carter Rowland on February 1, 1945. Rowland remained with the radio on his back while the commander continued moving forward. Those words would end up saving Rowland’s life as a round flew through the chilled winter sky, bursted and instantly killed the commander. Rowland felt the sensation of being struck solidly in the buttocks by what felt like a two by four from a shrapnel injury. The wound left a scar that required 50 shots of penicillin to quell the infection but that injury earned Rowland his second Purple Heart of the war. Rowland’s service in the military began at the young age of 17 following graduation in 1943 from Warren High School in Pennsylvania. He was sent to Camp Blanding, located in warm, sunlit Starke, Fla. He trained for 15 weeks in anti-tank warfare. The training covered methods to advance forward and destroy powerful German tanks in a variety of ways, including landmines and bazookas. After training, he boarded the USS General Butler en route to Orin, North Africa. After arriving in Orin after a tempestuous trip, he received orders to Casablanca via a “40 by 8” railroad car, so called because it could haul 40 men or eight horses, and then on to Naples, Italy, by ship. In Naples, Carter learned that he was to replace a member of the Third Infantry Division at Anzio and to retrain as a radio man. His new job entailed making decisions so that his battalion could complete a mission with as little direct enemy engagement as possible by calling down destructive artillery fire on German forces. The Americans did have some down time and Rowland can recall when two of his peers brought him to a “house of ill repute.” There were two women there, one in a yellow dress and the other, who appeared pregnant, in a purple dress. Rowland was just out of high school, so his older peers sent sent him off to the Santa Carla Opera House, where he would later go every day for a month-and-a-half for 17 cents a show. He and the division then went on to Anzio. The conditions in Anzio were horrific. The weather was wet, and the foxholes were filled with water. It was common for the men to get trench foot or frostbite. This slowed but did not stop the division which was then sent to Southern France where his battalion was involved in many gruesome battles and the young trooper saw many of his friends killed in action. He said faith and a prayer book sent by his mother helped protect him and helped him get through the worst he saw and experienced. While Rowland was making a radio transmission, he was hit and wounded in the arm by shrapnel from an enemy mortar. After proper medical care, he was released back into duty. After the injury in the buttocks, a U.S. Army Major physician believed that Rowland needed a change of scenery. He was ordered to work at a chemical plant in Rheims, France, far from the front lines. He knew it was a special operation because of the way he was greeted and taken care of, including having German prisoners cleaning his boots. The war ended shortly after that and Rowland arrived back in the United States five days before Christmas, 1945. In 1946, he married his wife in Warren and together they had four children. With the GI Bill, Rowland earned a bachelor’s degree from Gannon University. He also received a master’s degree in English from Penn State and a doctorate at Western Reserve. He was the chairman of the English department and later vice president of academic affairs at the State University of New York at Fredonia, an associate provost at Albany, and a lecturer. Rowland currently resides in Fredonia. Peri Pearson is a junior majoring in history at the State University at Fredonia. She is an intern with the Defenders of Freedom project at the Robert H. Jackson Center.